Electrical and electromagnetic methods are extensively used to map electrically conductive tracers within hydrogeologic systems. Often, the tracers used consist of dissolved salt in water, leading to a denser mixture than the ambient formation water. Density eﬀects are often ignored and rarely modeled but can dramatically aﬀect transport behavior and introduce dynamics that are unrepresentative of the response obtained with classical tracers (e.g., uranine). 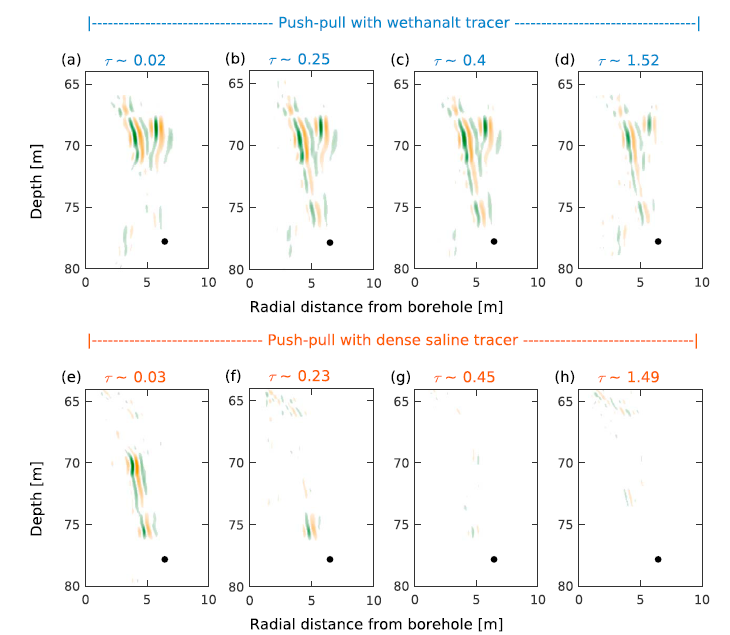 We introduce a neutrally buoyant tracer consisting of a mixture of salt, water, and ethanol and monitor its movement during push-pull experiments in a fractured rock aquifer using ground-penetrating radar. Our results indicate a largely reversible transport process and agree with uranine-based push-pull experiments at the site, which is in contrast to results obtained using dense saline tracers. We argue that a shift toward neutrally buoyant tracers in both porous and fractured media would advance hydrogeophysical research and enhance its utility in hydrogeology.